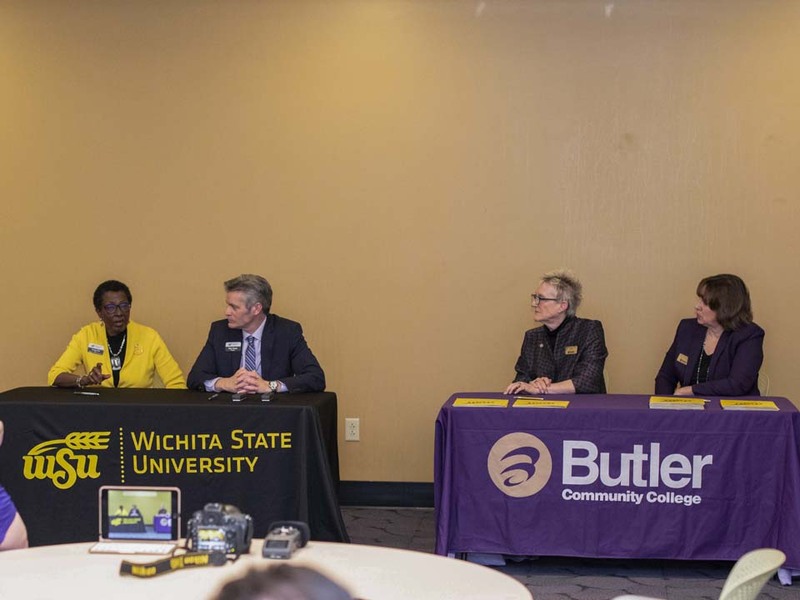 March 27 marked another advancement in the partnership between Butler Community College and Wichita State University. A total of 17 articulation agreements were signed at Butler’s Andover 5000 Building in the company of Butler and WSU administration and faculty. “I think this is simply an opportunity to celebrate the partnerships we have. We’ve always had long standing partnerships with WSU and I think this just strengthens them even more and creates additional wonderful opportunities and pathways for our students,” said Kim Krull, Butler president. Pathway creation was a topic highlighted by members of both institutions. Creating multiple avenues for students to excel and succeed is the ultimate goal. No matter if the student attends Butler or WSU, the objective is to see students attain their dreams by a venue that is most feasible for them. The articulation agreements create a seamless transfer from Butler to WSU and outlines the complete two-year curriculum at each institution. “As a first-generation college student who started at a community college, I know the value of these transfer and articulation agreements, and they can lead a student to something bigger and better than they ever thought they were able of accomplishing,” said Lori Winningham, Butler vice president of academics. Transfer students are a valuable asset to WSU as WSU holds the title of being the top college in the state for students who wish to continue their education after attending a two-year institution. “We are the number one transfer destination for all students in the state of Kansas – eight years running – and our biggest transfer partner is Butler,” said Richard Muma, WSU provost and acting president.